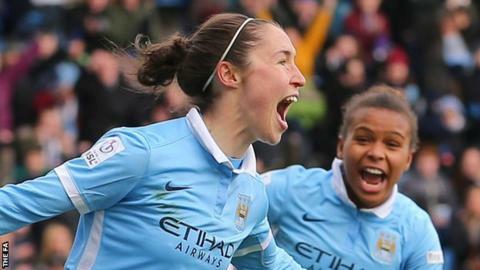 Manchester City Women moved to the top of the WSL 1 table as they beat an Arsenal Ladies team who played for more than 75 minutes with 10 players. Arsenal hit the bar from Fara Williams' early free-kick, but Jemma Rose was sent off for a poor challenge on Nikita Parris after just 13 minutes. City took the lead after the break when Toni Duggan crossed to the onrushing Jane Ross, who headed home. Duggan sealed victory with a penalty after Dominique Janssen fouled Parris. Match ends, Manchester City Women 2, Arsenal Ladies 0. Second Half ends, Manchester City Women 2, Arsenal Ladies 0. Offside, Arsenal Ladies. Daniëlle van de Donk tries a through ball, but Alex Scott is caught offside. Offside, Manchester City Women. Demi Stokes tries a through ball, but Stephanie Houghton is caught offside. Corner, Manchester City Women. Conceded by Dominique Janssen. Attempt missed. Toni Duggan (Manchester City Women) right footed shot from outside the box misses to the right. Assisted by Kosovare Asllani. Attempt blocked. Vicky Losada (Arsenal Ladies) left footed shot from outside the box is blocked. Vicky Losada (Arsenal Ladies) wins a free kick in the defensive half. Attempt saved. Marta Corredera (Arsenal Ladies) left footed shot from the centre of the box is saved in the bottom left corner. Assisted by Jordan Nobbs. Foul by Jane Ross (Manchester City Women). Alex Scott (Arsenal Ladies) wins a free kick in the defensive half. Emma Mitchell (Arsenal Ladies) is shown the yellow card for a bad foul. Foul by Emma Mitchell (Arsenal Ladies). Alex Scott (Arsenal Ladies) is shown the yellow card. Goal! Manchester City Women 2, Arsenal Ladies 0. Toni Duggan (Manchester City Women) converts the penalty with a right footed shot to the bottom left corner. Penalty Manchester City Women. Nikita Parris draws a foul in the penalty area. Penalty conceded by Dominique Janssen (Arsenal Ladies) after a foul in the penalty area. Attempt saved. Demi Stokes (Manchester City Women) right footed shot from outside the box is saved in the centre of the goal. Attempt blocked. Jane Ross (Manchester City Women) right footed shot from the centre of the box is blocked. Assisted by Toni Duggan with a headed pass. Substitution, Arsenal Ladies. Marta Corredera replaces Casey Stoney. Corner, Manchester City Women. Conceded by Sari van Veenendaal. Attempt saved. Kosovare Asllani (Manchester City Women) right footed shot from the centre of the box is saved in the bottom right corner. Assisted by Jill Scott. Leah Williamson (Arsenal Ladies) wins a free kick in the defensive half. Jill Scott (Manchester City Women) wins a free kick in the defensive half. Foul by Vicky Losada (Arsenal Ladies). Jane Ross (Manchester City Women) wins a free kick in the attacking half. Foul by Casey Stoney (Arsenal Ladies). Goal! Manchester City Women 1, Arsenal Ladies 0. Jane Ross (Manchester City Women) header from the centre of the box to the top left corner. Assisted by Toni Duggan with a cross. Vicky Losada (Arsenal Ladies) wins a free kick on the left wing. Sari van Veenendaal (Arsenal Ladies) wins a free kick in the defensive half. Corner, Manchester City Women. Conceded by Emma Mitchell. Attempt missed. Jordan Nobbs (Arsenal Ladies) right footed shot from outside the box misses to the right. Assisted by Daniëlle van de Donk with a headed pass. Attempt missed. Daniëlle van de Donk (Arsenal Ladies) right footed shot from more than 35 yards misses to the right. Assisted by Emma Mitchell. Offside, Manchester City Women. Jane Ross tries a through ball, but Toni Duggan is caught offside.